The same bee from different angles on different days, times and ambient light. Winter is coming and the bees are struggling to hang on. Regardless of the conditions they, she, can be found at dusk on the same grass stem as yesterday. As summer ends their numbers are no longer replenished. The young won’t waken until the temperature rises again and the moisture in the air increases. The colder it gets the less they eat and fly, the colder they get, the quicker they die. Much like us people … better keep the camera warm or it’s me next. And next year, as long as the conditions are right, there will be more bees to participate in the great cycle of things we know as nature. Thank you bee, it’s been fun following you around since spring. See you next year I trust, maybe plant some flowers for you. Hi Mark, What kind of bee is this? I am wondering as you mention the bee settles down to sleep on plant stems. I enjoyed your bee photographs in both recent posts. Hi Margaret. 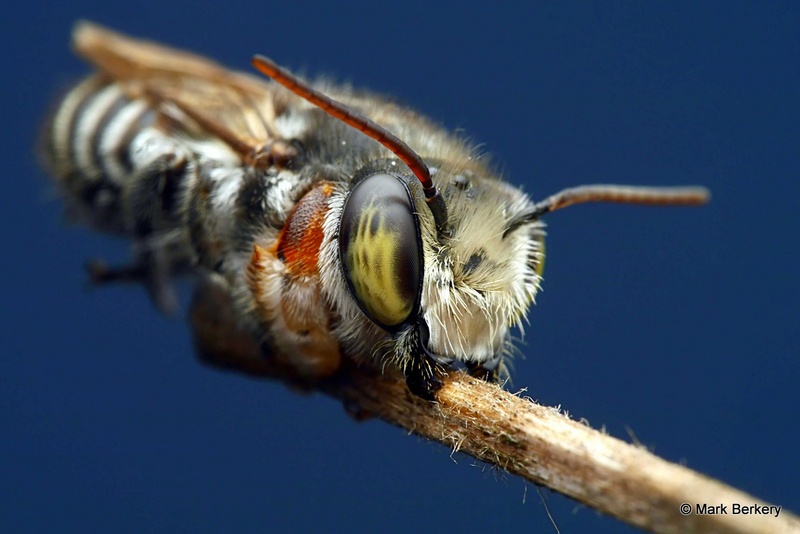 Many bees sleep gripping a stem of grass in their jaws. 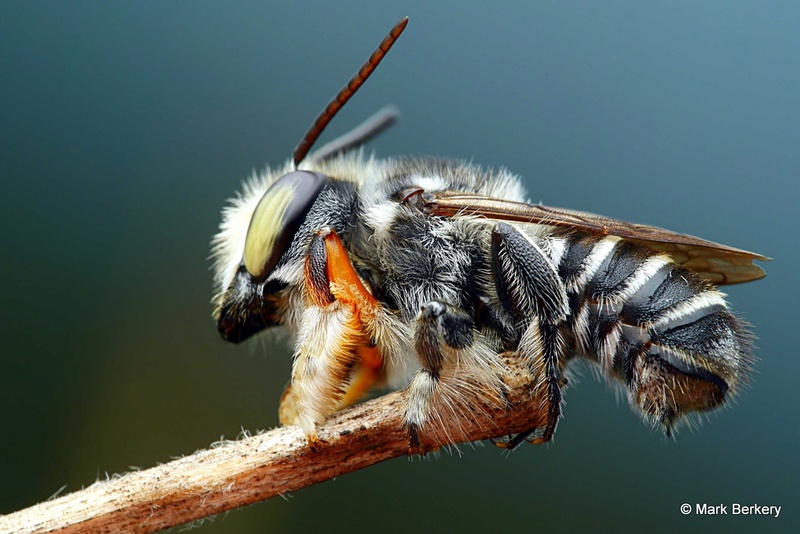 This kind is called megachille, maybe a leaf-cutter or resin bee. The butterfly bush has served well here this year, as long as they are dead-headed they flower a long time. Have to simplify it though, too much time spent watering. A lovely way to honor this little one, Mark; she’s a beauty! 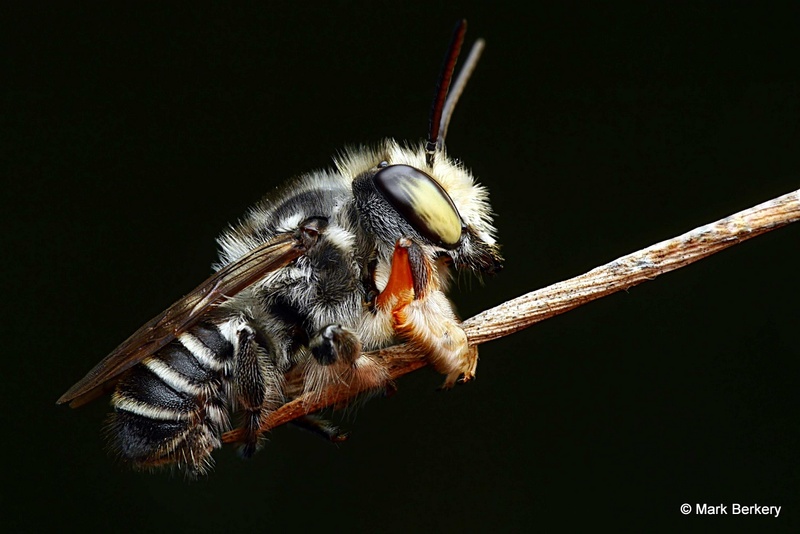 Bees are a barometer to what changes are happening worldwide. We shouldn’t undermine what the bees are telling us. Extraordinary photos! Thanks CJ, you are right, when the canary in the mine falls over it’s time to get out or change how things are done. It’s not happening though. Aww!! they’re so beautifully complex and tis true winter is coming. As summer ends in your half of the world it is beginning in mine and I am looking forward to more opportunities for flower an insect photos. I’m hoping I can produce at least a few as interesting as yours. I’m sure you will when you give it the time required. Wonderful image and tribute to our important bees, Mark. Thanks Jane. The little ones deserve acknowledgement … In fact without it they will disappear altogether. “better keep the camera warm or it’s me next” – made me chuckle. I have an aviary with four very old Cockatiels and the same applies to them. One day I will go out and find one or two have grown too old to cope with yet another winter and have literally fallen off the perch. I suppose they have a roof? They live in a beautiful purpose made aviary, yes.